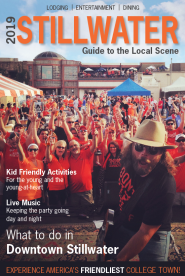 The festival, which in now in its 38th year, will be held April 18-19, 2015, in Downtown Stillwater on Main Street. Approximately, one hundred artists will be juried into the show. More than $1,300 in cash awards and ribbons will be presented on Saturday. Prizes for Best of Show ($500), 1st ($200), 2nd ($150) and 3rd Place ($100) for 2D and 3D categories. Last year&apos;s Festival Committee Choice Award went to Robert Cornman of Sunset Hills, MO. His artwork is being featured on the 2015 Poster. Applications being accepted in following categories: oils and acrylic; watercolor; caricature; pencils, charcoal and pastels; photography; metals; glass; jewelry; pottery (thrown, hand built and sculpted); wood; fibers; and other. Entries will be reviewed by an expert panel of three jurors for spaces at the annual fine arts show. Artists are required to submit at least four images of work to be displayed and sold, and one image that represents the overall look of the booth display. For additional information on the Stillwater Arts Festival, visit stillwater.org or contact the City of Stillwater at (405) 747-8070. Artists may also call (405) 533-8510 or e-mail for more information.